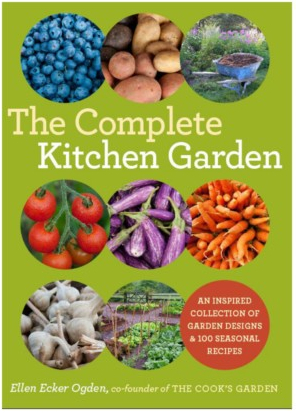 The Complete Kitchen Garden: An Inspired Collection of Garden Designs & 100 Seasonal Recipes, by Ellen Ecker Ogden, is a delightful book that combines vegetable garden design, organic gardening tips, and recipes. Ms. Ogden candidly admits that “a kitchen garden may just be a fancy name for a vegetable garden located near a kitchen door.” However, her designs demonstrate how attention to plant placement, color, and texture can create a garden that is both productive and beautiful. The Complete Kitchen Garden presents 14 garden designs varying in size and focus. For example, the Salad Lover’s Garden (15’ X 15’) is devoted to salad greens, and the Four Friends Garden (40’ X 24’) is designed for friends to share gardening and produce. Other designs include the Organic Rotation Garden (26’ X 26’) for beginner gardeners, the Patio Garden (15’ X 20’) using containers, and a Children’s Garden (15’ X 15’). Each design begins with a few words about that garden’s “personality.” There are tips for growing the garden, and a diagram with bed measurements, suggested plants, and their placement. More detailed information on specific plants and recipes for using that garden’s produce follows. Some of the recommended vegetable varieties may be unfamiliar. However, it would be easy to substitute a different variety if the gardener chooses. Ms. Ogden advises gardeners to use her designs as starting points, adapting them to reflect personal preferences and growing conditions. To help, the “Getting Started” and “Resources” sections have short discussions of practical considerations such as soil, garden orientation and garden maintenance. These sections also describe how paths, borders, benches, and gates can enhance a garden’s appeal and utility. Beautiful photos provide additional inspiration. Both experienced and novice gardeners will find something to like in this book. Cooks may want to read it for the recipes alone. The Complete Kitchen Garden (Harry N. Abrams, 2011) is available at the Arlington Public Library and at national booksellers. The retail price is $25.95. Find additional information on vegetable gardening at the Master Gardeners of Northern Virginia resource page and by visiting the Organic Vegetable Demonstration Garden at Potomac Overlook Park in Arlington, Virginia. This entry was posted in Organic Vegetable, The Master Gardeners' Bookshelf and tagged Ellen Ecker Ogden, garden design, The Complete Kitchen Garden, Vegetable Gardening. Bookmark the permalink.